Free Guide To Crown Green Bowls. holds Beginners coaching sessions on Saturday mornings 10 - 12.
every Thursday from 7pm to 9pm..
1st Visit is Free – Everyone is welcome to come along. The club is on Douglas Road in Hazel Grove. start against a high quality welsh side. London Rd Nth Poynton, are hosting a taster session for anyone of any age from 8 to 80 to come and have a free try to see if you like the sport. 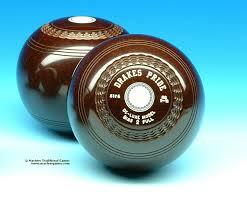 There will be bowlers available to show you the ropes and get you started. Make it a family event and bring the kids along. COME ALONG AND SEE FOR YOURSELF. YOU WILL BE MADE VERY WELCOME. Good Friday £1670 Invitation 32. Sponsored by Coors. Winner £400. Runner-Up £250. Last 4 £150. Last 8 £100. Last 16 £40. Good Friday, 19th April 2019 10am Start. 9-15am Practice. Good Friday Invitation at Houldsworth WMC. Any problems please ring Glen Beeley on 07939-205513. There will be refreshments available all day and a bookmaker will be in attendance. Good Friday £1670 Invitation 32. 19th April 2019 10am Start. 9-15am Practice. These are the players for the Good Friday Invitation at Houldsworth WMC. The draw will be made at a later date, the draw will not be published but approximate starting times for players will be posted. More news to follow on this top class invitation. on Sunday 10th Feb from 10am. Anyone welcome to attend, not just Longdendale club members. All games 31up off 3. Cheques payable to G. Beeley within 21 days of entering. Bank transfer can be arranged on request. Stockport Cricket Clubs are looking for players for their Wednesday night team in the Cheadle and District Ladies Bowls League. 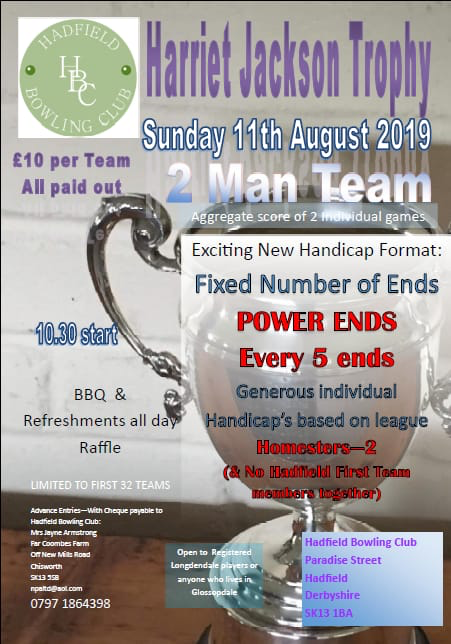 New or experienced players would be most welcome, They are are good club in Division A, have a great bowling green and very friendly players. Please contact the Secretary Mrs Lorraine Parks on 0161 428 4997 for further information. Glossop Bowling Club is looking for new players. Female and male players. Beginners or more experienced players of all ages. Starting in April 2019 - September 2019. Come along on a Wednesday night 6.30pm to have a go. We are located at North Road in Glossop. Coaching and free use of bowls on a Wednesday night. Bowls is a fun activity and exercise for all ages. Email :- davidelshaw@aol.com for more information. Information about the May Bank Holiday Open to follow.